Poor Law Union (Rathdrum) - did he seek relief from the parish, have to enter the workhouse or perhaps he served as a Governor on the Board of Guardians or was a supplier? Barony (Arklow) - were there land records for him that might be organised by this ancient division? Parish (Drumkay) - was the family mentioned in any surviving parish registers or vestry minutes? 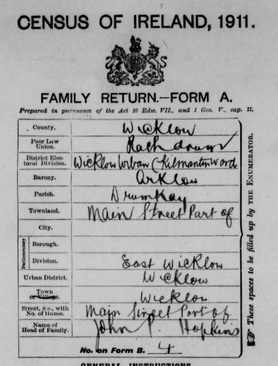 Parliamentary Borough & Division (East Wicklow) - was he registered as a voter? Voter lists may also be organised by DED in major towns and cities. Urban District (Wicklow) - perhaps there may be records of him paying rates on properties? Various different land divisions appear on different forms from these 2 surviving censuses, some of which I have to admit I'm not sure exactly what they are and how they might help you further e.g .Constabulary District and Sub-District? However, I ought to include some "words of wisdom" I found printed on one of the Enumerator's collating forms that quite frankly made me want to weep - just when you think you've got to grips with some of the fundamentals of Irish geography, apparently "A townland or street could be in 2 Parliamentary Divisions or could be in more than 1 DED or more than 1 parish" - you have been warned!